Since 2004 the Long Island Acoustics guitar duo has set the tune to events throughout Long Island and Manhattan. Specializing in contemporary arrangements ranging from fingerstyle to smooth jazz and pop, Rob and Steve are a talented duo who’ll play the songs your guests love. This professional acoustic guitar duo is great for any special event, including weddings, anniversaries, birthdays, restaurants, corporate events, Christmas parties, and trade shows. Although specializing in Long Island wedding music, the duo can also play for cocktail hours, private parties and intimate living room concerts. Vocal and Instrumental Performance: LI Acoustics will tailor their performance to your event and/or venue. Performing instrumental acoustic guitar music as well as popular vocal songs if appropriate. Do we take special requests? For a recent wedding we were asked to work out an instrumental arrangement of 'Can't Find My Way Home', by Blind Faith. Click to here our version. Long Island Acoustics performs throughout Long Island and , the New York area. They provide entertainment for Weddings, Restaurants, Corporate Events and Specialty Trade Shows. They are also available for Cocktail Hours , Private Parties and other Special Occasions. In addition to providing the finest Long Island Wedding Music, we also do intimate Living Room Concerts for you and your friends!!!!! Long Island Acoustics is proud to be the factor making your Cocktail Hour and/or Wedding ceremony a little more unique. As guitar players we enjoy and appreciate fine classical guitar performances, but we often find cocktail hours provide a small audience for this genre. We believe that we can take that same classical guitar approach, liven it up a bit, and then perform songs that all your guests have heard before. Songs they have grown up with. Songs they love and enjoy. We understand that at your cocktail hour our role is to provide background wedding music, but that doesn't mean it should be unmemorable. After all, who would want any part of their wedding to be unmemorable? Visit our music sample page to get an idea of the style and type of cocktail party music that we perform. Keep us in mind for your non-cocktail hour entertainment as well – we perform for many other private and corporate special occasions and functions throughout Long Island. Click here to learn more about Wedding Cocktail Hour Music & Entertainment. February 2nd, 2016 - Hey Steve and Rob, Thanks again for playing our wedding, you guys are fantastic. When we first selected you guys to play our wedding, we had only ever heard you play through the music samples on your site, which are amazing (your "Dust in the Wind" is soooo good). However, we still did not know how you would sound live, and we didn't know what your acoustic guitar arrangements would sound like. However, the minute our ceremony started and you guys played the first notes of "In Your Wildest Dream" by the Moody Blues for our Processional music, I had goosebumps. I'm seconds away from walking down the aisle, and I'm thinking "damn, that sounds great!". And so it went for the rest of your performance...you guys were just perfect. I spent a good portion of my cocktail hour interrupting my friends from speaking, mid-sentence, just to listen and smile every time you started a new song. My wife and all our guests loved it---I had an uncle who was basically playing name-that-tune and nodding his head the whole time. I had a cousin, getting married next year, who was so impressed by your performance she already wants to book you guys for her wedding. You played every song I asked for and learned five additional songs not on your song list, which we greatly appreciated ("Back on the Chain Gang" was just lovely). Basically, I could not have asked for more, it was outstanding, and I cannot wait for the videographer to send back our wedding footage so we can listen again. Thanks again guys--rock on! December 17th, 2015 - Great job once again. My entire staff loved your music. I always know who to call to make my cocktail party a success. October 12th, 2015 - Rob and Steve you guys were great. The cocktail hour music was splendid and I received many compliments from all my guests. Thank You! September 7th, 2015 - Thanks to both of you for taking the long drive up from Long Island to Ithaca. I heard your guitar duo perform at a friends wedding in Oakdale(Long Island) and I knew I had to ask you to play at my wedding. The ceremony music was fabulous and although my requests were not your ordinary wedding music choices you performed them perfectly. (sorry, about the short notice). As I expected, my cocktail hour guests had nothing but compliments. Thanks Again! August 23rd, 2015 - I just saw you perform yesterday in Amityville. I actually perform in a rather popular band here on Long Island and I am not easily impressed. However, your playing was absolutely top notch. In fact, I was a little surprised looking at your website today that your specialty is performing at Weddings and Cocktail Hours. Yesterday I was treated to 3 hours of classic rock, jazz, Spanish guitar, great vocals and just some top notch entertainment and fun. If cocktail hours are your true specialty then I need to get married again. Can't wait to see you again. May 12th, 2014 - Thank you so much for the job you did at my wedding. The ceremony music was just what we wanted, and the cocktail hour music was perfect. I truly was shocked at how many people came up to me and commented on how great your playing was. I only wish I could have spent more time during the cocktail hour to actually relax and enjoy the music. ...Click Here to read more Testimonials. 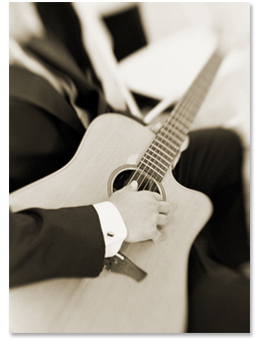 Long Island Acoustics provides quality cocktail hour wedding music, cocktail party music and cocktail hour entertainment. We would like to thank all our friends who are involved with creating the very best in Long Island Weddings. Long Island Acoustics will be a featured guest at an upcoming Long Island Fingerstyle Guitar Club seminar. Stay Tuned for Date and Time.